380 pages | 137 B/W Illus. Although many books outline approaches for successful ERP implementations, the data shows that most ERP efforts yield minimal return on investment (ROI), with most projects failing. 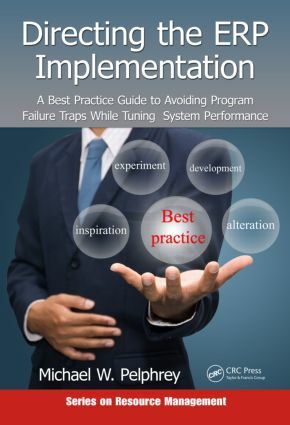 Directing the ERP Implementation: A Best Practice Guide to Avoiding Program Failure Traps While Tuning System Performance supplies best practices along with a proven roadmap for improving the odds of system implementation success. By adhering to the time-tested framework outlined in the book, your organization will be able to commit to the precepts and practices that lead to successful implementations. Supplying an innovative and fast-track, yet comprehensive, approach to ERP implementation success, the book provides practical guidance to help executive leadership do the right things along the ERP journey. Highlighting the essential planning ingredients that are frequently omitted from ERP implementation start-ups, the book provides readers with the planning framework and proven foundational methods and principles to ensure smooth planning and systems deployment, product quality, and maximum ROI. The book covers everything from software selection and integration to common snags, traps, and black holes. Best practice tool sets include proven methods such as information workmanship standard, which defines quality; conference room piloting, which assists in matching teams to objectives seamlessly; education, training, and implementation framework, which addresses preparing the operating production environment; and project monitoring and deployment, covering project and risk management. How Can a Radical Visionary Begin the Process? Michael W. Pelphrey obtained his BA in business administration from California State University, Fullerton, California, and his MS in finance from West Coast University, Los Angeles, California. He has over 30 years of experience with a broad and varied background in the ERP marketplace. Not only has he been a user of ERP solutions, but he was also a director of technical and business consultants at Comserv, a leading ERP software company located in Stuart, Florida; an ERP project manager; an ERP business architect; and a partner at BDO Seidman, an accounting and consulting practice. Functionally, he was the president/CEO of a mid-market just-in-time manufacturing firm with nine divisions spread across the United States. Throughout his career, he has supported, in varying degrees, over 300 ERP projects for Fortune 500 companies as well as mid-market and small businesses. As an executive and business architect, he was highly successful at driving dynamic gains in revenue and profit and market share in small to Fortune 500 arenas. As an expert in IT Program Management, he focused upon cost/schedule deliverables, customer service, and collaborative team proficiency. In addition, he was awarded IT Employee of the Year for Operational Performance (Fortune 100 Company). He has been a frequent article contributor and speaker at the American Production and Inventory Control Society, the American Society for Quality Control, and the Society of Manufacturing Engineers.